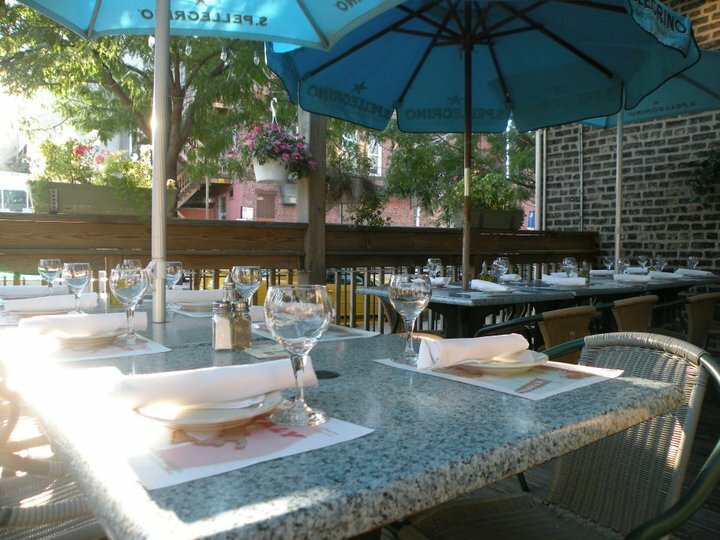 All of our entrees include a complimentary garden salad. Sautéed shrimp, baby artichokes and mushrooms in white wine. 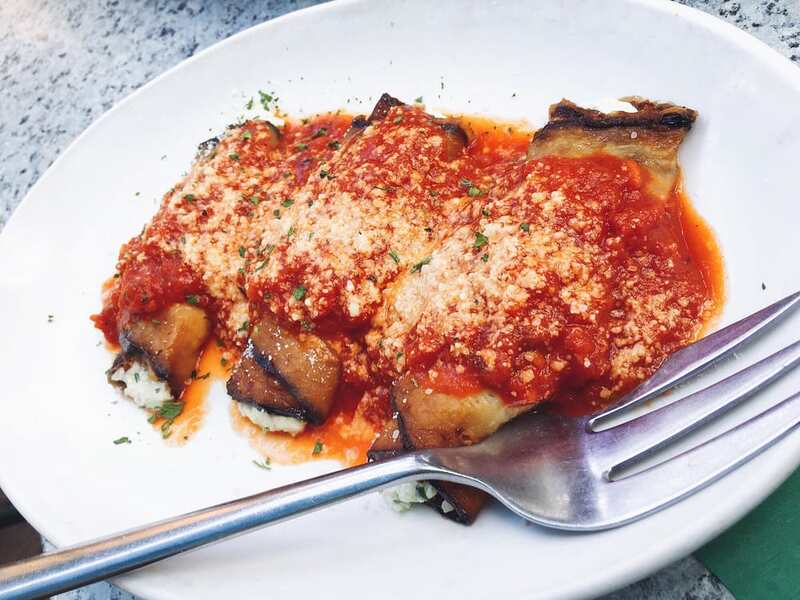 Eggplant rolled and stuffed with four cheeses in a light marinara sauce. Choice of fried calamari served with marinara sauce, or grilled with lemon and extra-virgin olive oil. Thinly sliced bread topped with fresh tomato, olive oil and basil. Thinly sliced beef filet mignon with arugula and parmigiano shavings. Baked clams stuffed with bread crumbs, parsley and extra-virgin olive oil. Classic Caesar salad with parmigiano and croutons in homemade Caesar dressing. Field green salad with walnuts, raisins and bleu cheese in a sweet balsamic vinaigrette. 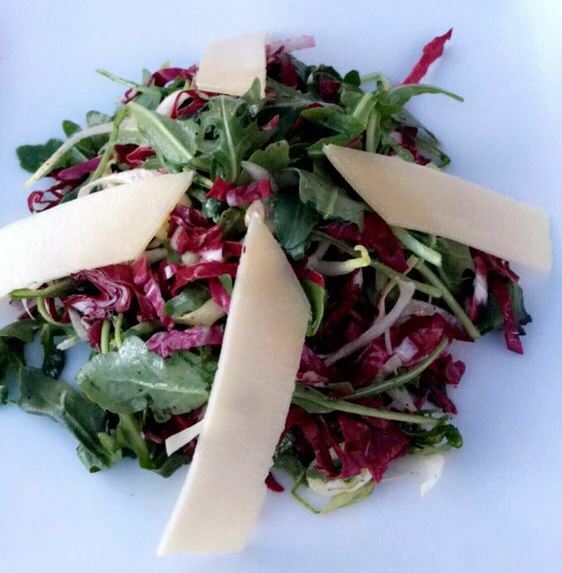 Belgian endive, radicchio and arugula tossed with extra-virgin olive oil and lemon topped with parmigiano shavings. Sliced Beefsteak tomato layered between fresh baby mozzarella and basil leaves in a light extra-virgin olive oil. Thin, long tube-shaped pasta tossed in tomato sauce with sautéed Italian bacon and onion and topped with pecorino cheese. Rigatoni with portobello mushrooms, garlic, sundried tomatoes and peas in a cream sauce. Linguine sautéed in tomato sauce with shrimps, sea scallops, Manila clams, squid, garlic and white wine. Linguine with clams sautéed with garlic, olive oil, white wine, parsley and crushed red pepper. 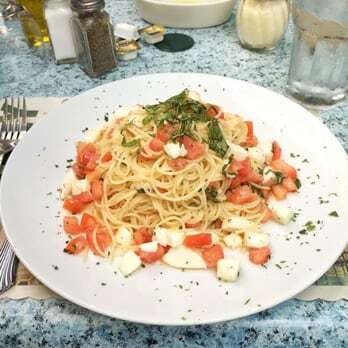 Angel hair pasta tossed with fresh tomato, fresh mozzarella, basil and garlic in extra-virgin olive oil. Tortellini stuffed with veal in traditional tomato meat sauce with a touch of cream. Ravioli filled with pumpkin squash and tossed with butter, sage, prosciutto and walnuts. Homemade potato dumplings, tomato sauce, fresh basil and parmigiano cheese. Homemade spinach potato dumplings in a blue cheese, mascarpone, and parmigiano cream sauce. Lasagna layered with carrots, onions, mushrooms, zucchini, spinach and ricotta cheese. Lasagna layered with a traditional meat sauce and besciamella sauce. 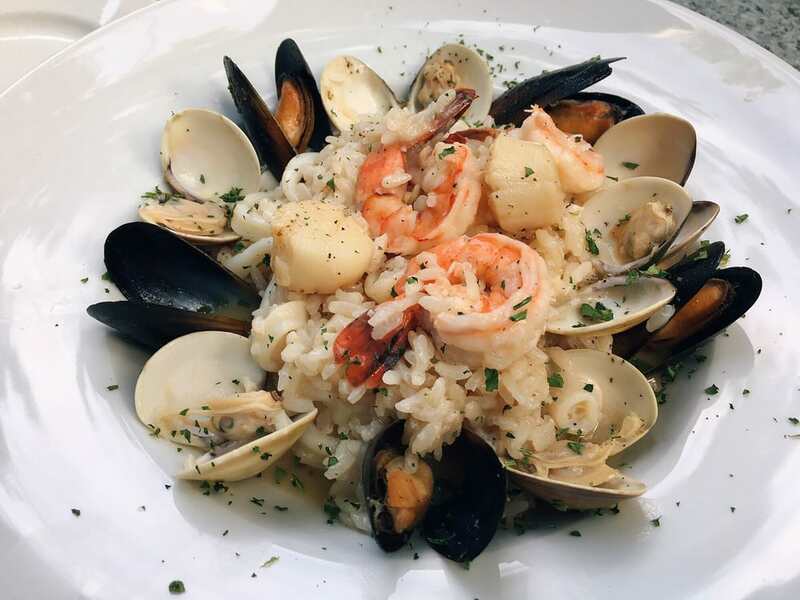 Arborio rice sautéed with shrimp, squid, sea scallops, and Manila clams. Arborio rice with porcini mushrooms in a light truffle oil. Oven-baked tilapia, with fresh aromatic herbs, served with roasted potatoes and vegetables. Sautéed halibut with anchovy, green olive, capers, rosemary, fresh tomato, onion and garlic. Breaded shrimp de jonghe in a white wine, garlic and butter sauce served with mixed vegetables. New York steak with fresh rosemary, grilled and topped with aromatic olive oil, red wine and butter sauce. Grilled lamb chops sautéed with garlic and fresh rosemary in a light red wine vinegar, served with mixed cubed vegetables. Veal scalloppini topped with prosciutto di Parma and fresh sage, sautéed in white wine, served with roasted potatoes and vegetables. Medallions of veal sautéed with lemon, capers pine nuts and spinach. Sautéed diced chicken breast with asparagus, white wine and garlic, served with roasted potatoes. Sautéed chicken breast with fresh tomatoes, black olives, fresh thyme, fresh basil, garlic and onion served with roasted potatoes. Ask about our current selection!